WAIT! Are You Sure You Want To Pass This Up? Just $9 Gets You My Entire Wealth System. How Many Sleepless Nights Have You Spent Worried Over Money? It's Time to Put Your Money Worries to Bed Once And For All! Discover the Brand New Program That Shows You How To Clear Your Limiting Beliefs About Money So You Can Attract Massive Amounts of Wealth and Start Enjoying the Life You Deserve! But instead of enjoying a deep, peaceful sleep you're wide-awake. Indigestion churns in your stomach and up your throat. You stare at the ceiling while your mind roils with fear, doubt and worry. You're afraid because the rent is due – and you don't have the money. And you're angry because – dammit! – you can only work so many hours. And what's worse, it's always someone else at work that seems to get the raise, promotion or catches a lucky break. You don't know what to do. The walls are closing in and time is running out. If only there was some way you could finally enjoy the peace and prosperity you deserve. But you've tried it all – working harder, picking up extra shifts, you've even dabbled with the Law of Attraction – but nothing seems to work. If that sounds familiar I want you to know you're in the right place, and everything is about to change for the better for you. Hello, I'm Dr. Steve G. Jones. Over the next few minutes I'm going to share with you what might be the fastest and most effective way to transform your financial reality. Yes, that's an incredibly bold promise. But continue reading and you'll soon see why I can stand by the promise 100% and how it has the potential to change your life forever! Ring any bells? You're certainly not alone. Even though the economy has rebounded a lot of people are still struggling. And a LOT of people are looking for a fast, proven way to attract money so you can finally stop worrying about financial stuff and start enjoying life. If you're nodding your head right now and thinking, “Yeah, that sounds about right!” then know that I've created something especially for you. This powerful audio program presents 8 distinct training modules that will erase the limiting money beliefs that are preventing you from enjoying the peace-of-mind and prosperity you deserve. Worry because you're living each month paycheck to paycheck? Disappointment when you have to tell your child or spouse (again) that the vacation is going to have to wait this year? Frustration because you work hard – really hard – but you feel like you don't have a damn thing to show for it? Stress over the fact that your financial destiny feels completely out of your control? How To Use This Program? Each training module comes with a 20 – 30 minute audio recording that you can listen to while you exercise, shop, drive to work, when you first wake up or just before you go to bed. Just pop the recordings on your iPod or preferred music player and listen anytime, anywhere! Listen to the recordings again and again, and let the training wash over both your conscious and subconscious mind. You'll find the experience exciting, inspiring and invigorating! Simply by listening and allowing your mind to be open to this experience, and doing nothing else in particular, you'll feel your limiting money beliefs loosen, lighten and lift away from you. Here's a closer look at what you'll get when you claim your copy of “Transform Limiting Money Beliefs” today. If you find yourself excited at the idea of having more money in your life, but don't consider yourself an especially spiritual person then this module is for you. I'll show you a logical, proven process for letting go of your limiting money beliefs and opening yourself up to abundance. In this module, I guide you through a process of examining your subconscious so you can open your mind – and life – to real wealth and prosperity. You'll learn a powerful “interview” process you can use right now to finally harness the almost immeasurable power of your subconscious mind. You've probably heard how meditation can help with stress. (And feeling that you don't have enough money is certainly very stressful!) Even Harvard Medical School recognizes the benefits of meditation: They're currently conducting a five-year study into how meditation can affect genes and brain activity in the chronically stressed. If you've tried meditation in the past but were never quite sure if you were doing it correctly, then this module will help. In it, I'll take you through a step-by-step process for using meditation to reduce your stress levels and let go of your limiting beliefs. This module begins with a look at the possibility that multiple versions of you exist across multiple planes of space and time, and how connecting with those multiple selves can help you attract money (or anything else) faster and easier. Even if there's just the possibility that the Future-Self Technique will work for you, even if it's only possible that you could use this technique to attract an abundance of wealth, just think of how much you could potentially lose if you don't try it out for yourself! Once you've listened to Module Five you'll be equipped with a powerful and new way to communicate with yourself. Sadly, the vast majority of people struggle through life never realizing that the statements they repeat to themselves create their reality – and can keep them trapped in lives of lack and want. You'll discover how to use the principles of NLP to make subtle, but unbelievably powerful, changes to the words you use with yourself, so you can shift your reality towards one of wealth and abundance. Emotional Freedom Technique (EFT) helps you remove mental barriers and clear emotional challenges. Once those obstacles have been removed you'll find it much easier to make swift steady progress towards your financial goals. Worry about money can wreak havoc on your body, as can putting in long, hard hours at work. Do you often find yourself feeling tired, run down and burned out? When your physical condition is compromised you're even more susceptible to the negative thoughts and limiting beliefs that plunge you into the darkness of stress, worry and lack – talk about a vicious cycle! In this module, you'll learn how to use yoga to clear your negative beliefs about money, decrease your stress levels and increase your energy so you can enjoy wealth and good health! Imagine if you had the ability to call upon the Archangel Michael and enlist angelic assistance in overcoming your limiting beliefs? Incredibly, you do! In this module you'll learn a powerful, sacred process for asking the Archangel Michael to help you banish the darkness of negative thoughts and cut ties with the limiting beliefs that are holding you down. 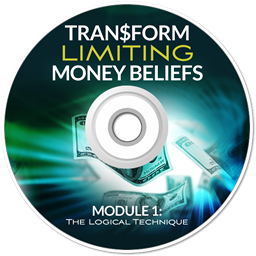 What Makes “Transform Limiting Money Beliefs” Unlike Anything Else You May Have Tried Before? The “Transform Limiting Money Beliefs” audio program takes a holistic approach to helping you clear limiting beliefs. As you've seen, “Transform Limiting Money Beliefs” incorporates meditation, Emotional Freedom Technique, Future-Self Technique, Neurolinguistic Programming, yoga – and more! – to offer you the most comprehensive program of its type available anywhere. Why is a holistic approach important? Because by offering you a variety of techniques for clearing away the limiting money beliefs that stand between you and the rich, abundant life you deserve you'll be able to achieve results far faster and easier than you would if you tried only a single technique. The truth is, not every technique is right for every person. Just think of how much that person stands to miss out on! With “Transform Limiting Money Beliefs” that's never a problem for you. You may experience incredible success with the very first technique you try – congratulations! Or, you may find that one particular technique doesn't especially resonate with you – and that's okay. Because you'll have 7 other techniques to try and any one of them has the potential to flood your life with abundance. Yes, it will show you how to wipe away the limiting beliefs that, right now, are preventing you from enjoying the wealth and prosperity you deserve. Recognize and alter unseen thought patterns that drive your actions and create your reality. Attract not only money but also relationships, professional success, cars and homes – it's up to you! Unleash your incredible potential in EVERY aspect of your life. See, this program is designed to equip you with the skills and tools to overcome any of your limiting beliefs – not just the ones about money. Money is a great place to start learning these skills because it is a challenge for so many of us, but the real power of this program comes from the fact that you can use it to have, do, or be just about anything you can imagine. 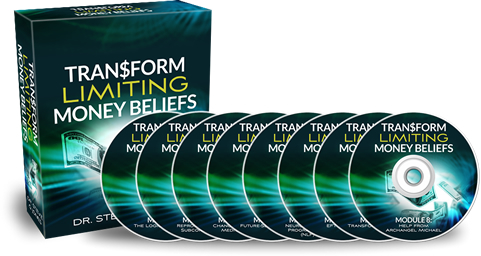 You can get instant access to “Transform Limiting Money Beliefs” today for only $27 $9! Why Is It Only $27 $9? The 8 modules included in the “Transform Limiting Money Beliefs” program contain nearly 3 full hours of audio content. Normally, when I meet with individuals and companies to share the exact training you'll find in this audio program I charge $25,000 for two hours. That means “Transform Limiting Money Beliefs” contains at least $37,500 worth of my time. If I were to offer this program at $297 or even $497 (that's the price my accountant suggested) it would be a great value because as soon as you put this material to work you could have money entering your life from places you'd never have expected. If money worries haunt you day and night, the last thing you need is to find something that promises you a brighter financial future … but is priced out of your reach. At only $27 $9 (a fair bit less than what you probably paid for Internet last month), “Transform Limiting Money Beliefs” is priced within everyone's budget. At such a heavily reduced price you may be wondering why I don't just give the program away. Here's why: As a rule, we tend to undervalue those things we receive for free. Especially online. Think of how many free eBooks, special reports, and audio or video trainings you've downloaded … but never quite got around to using. I'm exactly the same way. My dream is that you'll take the materials included in this program, take action on them, and prosper like never before. And by asking you to make a small investment in yourself by purchasing this program there's a much better chance of that happening. Once you've put “Transform Limiting Money Beliefs” to the test, once you've put it to work in your own life, I believe you'll be thrilled that you invested in yourself today. And I hope that you'll be so impressed with the results you've enjoyed through this program that you decide to better yourself through one of my other trainings in the future. “Transform Limiting Money Beliefs” is a bargain. To put it mildly. And if you'll take action on even a handful of the secrets it reveals, then you could look back on this day as one of the smartest financial decisions you've ever made. If you've read this far it's because you're curious (and probably very hopeful) that “Transform Limiting Money Beliefs” will make good on the many promises I've made to you in this letter. After all, imagine how your life will change when you're no longer constantly worried and stressed about money. Just think of what it will be like when you know you have enough, more than enough, to cover the mortgage, groceries, insurance and other necessities … plus lots left over for vacations, an extra car, that boat you've always dreamed of, a new wardrobe, savings, investments – it's up to you! Well, just thinking about that is enough to get anyone excited – and you are excited. But you're also cautious. Skeptical even. Yes, you've read the testimonials from other men and women who have used my training and guidance to achieve incredible results in their lives … but you've been burned in the past and you don't want that to happen again. And even though I'm absolutely confident that you can use “Transform Limiting Money Beliefs” to attract lots of money into your life and dramatically alter your family's financial reality, I don't blame you if you think it all sounds just a little too good to be true. That's why I want you to try it out today RISK FREE for 60 days so you can see for yourself just what a difference it can make in your life. Claim your copy of “Transform Limiting Money Beliefs” today by clicking the “Order Now” button below. As soon as you click the button you'll be whisked to a secure download page and given INSTANT access to all 8 modules of the “Transform Limiting Money Beliefs” audio program. Listen to the recordings. You can listen in the car, on your commute to work, when you're out for a jog or at the grocery store or getting ready for bed at night. Listen to the recordings and take action on my instructions. What you'll soon find is that your limiting beliefs about money melt away like snow on a sultry July afternoon and you'll finally be in control of your financial destiny. You'll be amazed at how your life transforms in just a few short months as a result of these recordings. However, in the highly unlikely event that your expectations aren't blown out of the water, if you're not completely satisfied for any reason (or no reason at all), simply let me know within the first 60 days and I'll issue you a full and complete refund of every penny of your purchase. No hassles. No questions asked. That's right, don't decide now. Just download the program, listen to it and give my ideas a try. If it doesn't deliver on everything I've promised and more, if it doesn't help you let go of your limiting beliefs about money so you can finally step into the bright, abundant financial future you deserve; if it's not a good fit for you, your style or where you're at in life right now, no problem. You can get every penny of your investment back thanks to my no-questions-asked 60-day money-back guarantee. All the risk is on my shoulders. You have nothing to lose but your limiting beliefs. Does that sound fair to you? Here's How To Get Started Right Now! “Transform Limiting Money Beliefs” is available NOW! get immediate access to all 8 audio recordings. Of Your New Financial Destiny? Will today be the first day of a radiant, abundant financial future for you and your family? It will be if you claim your copy of “Transform Limiting Money Beliefs” right now. But if you do nothing, if you back away from this page without taking positive action, what will change in your life? How will tomorrow be any different from today? Don't let this opportunity slip through your fingers. Get your copy of “Transform Limiting Money Beliefs” now! P.S. – You've seen people at your work, in your neighborhood, and in your extended family that are no smarter than you, work no harder than you do (and often not nearly as hard as you do), and yet they're much, much wealthier than you. Have you ever wondered what they know that you don't? It may be that they're simply ready for wealth and abundance. The truth is, you will only attract money when you're ready to attract money. “But I'm ready to attract money now!” you say. Let me be blunt: If that were the case, you wouldn't be reading this now because you'd already have as much wealth in your life as you want. “Transform Limiting Money Beliefs” will walk you through step-by-step processes for clearing away the unconscious beliefs and unseen thought patterns that repel wealth, and show you how to replace them with a mindset that magnetically attracts money. You too can enjoy incredible wealth and abundance. And it starts when you claim your copy of the “Transform Limiting Money Beliefs”program! P.P.S. – Remember, your decision to try this audio program today is protected by a 60-day money-back guarantee so you risk absolutely nothing when you click the “Order Now” button below to claim your copy!